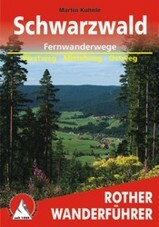 The “Middle Way” starts in Pforzheim, just as the two other famous paths in the Black Forest, the Westweg and the Ostweg. The terrain is a bit less mountainous compared to the Westweg. In the southern part forests and farmland alternate. A little north of the Schluchsee, the path divides in a western and eastern section, meeting again in Waldshut at the Rhine and the Swiss border. Both sections explore interesting rocky fissures. The path is well maintained, well marked, and there is plenty of accommodation. Wanderkompass.de gives detailed descriptions of the different sections of the Mittelweg, with Google maps and GPS data.